Most of the high-end, mid-range and even budget 120mm / 140mm CPU Air coolers are pretty tall in height, which makes them unfit for smaller computer cases and motherboards, or even with standard mid-tower cases that do not have enough height clearance for tall CPU coolers i.e. 150mm in height or taller. So, if you are looking for a compact yet powerful enough CPU Air cooler for your Processor and PC case then a 92mm CPU cooler is the best option. These CPU coolers come with 92mm fan and heatsinks that are lower in height e.g. around 140mm or less. 92mm CPU coolers are also known as Mini-Tower CPU Coolers or Compact CPU Coolers. 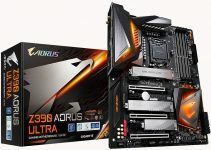 They offer much better performance over low profile CPU coolers and delivers almost the same level of performance of a 120mm or 140mm CPU cooler of the same price. Moreover, they are much better than the crappy stock CPU cooler that comes bundled with the processors. 92mm CPU coolers can easily fit in most of the Mini-ITX cases, SFF cases and almost all the Mini-Tower and Mid-tower computer cases. RAM clearance and PCI-Express slot clearance is never a problem with these 92mm CPU coolers as normally they do not obstruct DIMM and PCIe slots. You can also do bit a little bit of overclocking too on these compact CPU coolers, but generally they are meant for running your processor at stock speeds only. So, for users with compact builds, here I am going to list down the best 92mm CPU coolers for both Intel and AMD Sockets that you can also use with bigger computer cases too. Here are the best 92mm CPU coolers that support almost all the major Intel and AMD sockets. These compact CPU air coolers offer best RAM clearance and clearance for PCIe slot on any motherboard. 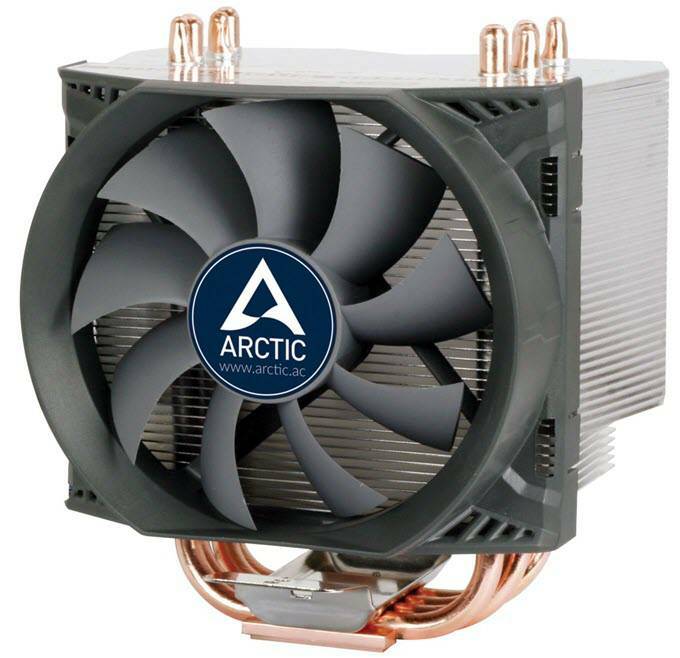 If you are looking for a powerful, affordable, quiet and durable 92mm CPU cooler then Arctic Freezer 13 CO is a great choice. It is compatible with most of the Intel and AMD CPU sockets including AM4 Socket. 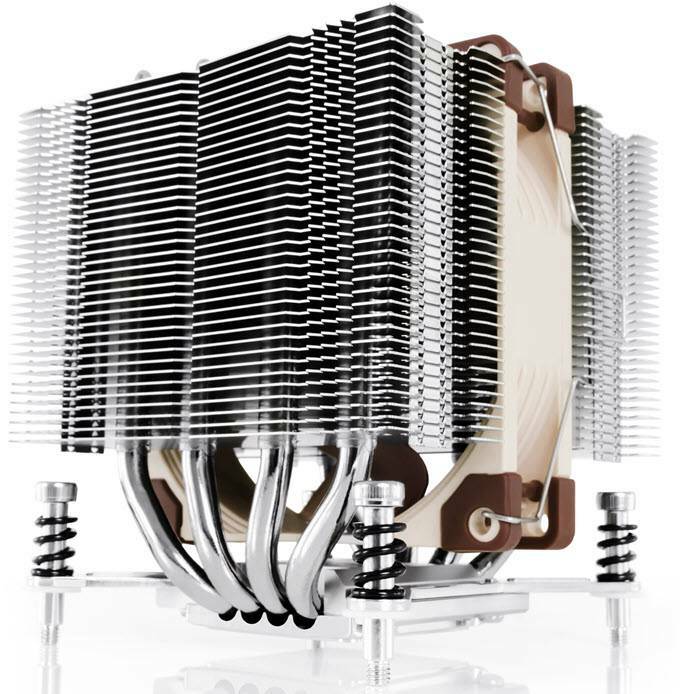 The CPU Cooler come with 45-fin heatsink with four copper heatpipes for better heat transfer. A 92mm PWM fan cools the heatsink, and spins in the range of 600 to 2000 RPM. The fan comes with dual ball bearing for longer lifespan, and is pretty quiet in operation having maximum noise level rating of 24.4 dBA at full speed. It must be noted that it is the Continuous Operation or CO version CPU Cooler, which means it is designed for non-stop continuous operation for use in servers and PCs with high running time. The CPU cooler stands at 130mm tall and can fit in most the small form factor and HTPC cases. However, it is a bit bulky compared to other compact CPU coolers, so if you have a really small case then you might have to check for the clearance stats of the case before buying it. It also offers good amount of RAM clearance at 33mm, which I think is enough for both Intel and AMD systems. For Intel sockets, it has push-pin mounting system for easy installation, which most of you have already seen in Intel Stock coolers. For AMD also, the installation is quite simple using the metal clip mounting system. The performance of this CPU cooler is way better than the OEM Stock CPU Coolers, and you can do a little bit of overclocking too depending on the CPU, and by monitoring the thermals. The CPU cooler comes with pre-applied Artic MX-4 thermal paste, which is one of the best thermal compounds in the market. The CPU cooler supports up to 140W TDP processors and offers 200W of cooling performance. A non CO version of this CPU Cooler is also available with Fluid Dynamic Bearing Fan, while other specifications remain the same. You can check out both these variants from the links given below. When it comes to sheer performance and quality then it is hard to beat Noctua CPU Coolers and Fans. Here we have Noctua NH-U9S CPU Cooler, which I think is the best 92mm CPU Cooler that you can get for your system. It is a premium quality CPU Cooler that is compatible with wide range of Intel and AMD CPU Sockets including Intel LGA 2066 and AMD AM4. The heatsink is slimmer and asymmetrical in design that allows 100% RAM and PCIe cards compatibility, even on mini-ITX motherboards. It comes with five copper heatpipes and a copper base for better heat transfer to the heatsink. The heatsink is cooled down by a NF-A9 PWM fan that spins at speed in range on 400 to 1200 RPM. The fan is PWM controlled and comes with Noctua’s proprietary SSO2 bearing for quietness, durability and longevity. Also, the fan is very silent in operation fan and generates maximum noise of 22.8 dBA at full RPM. You can also reduce the noise further to 16.3 dBA by using L.N.A (Low Noise Adapter) that comes along with it. It also supports dual fan in push pull configuration, so if you have enough clearance then you may add another NF-A9 PWM fan for enhanced cooling performance. The height of this CPU cooler is 125mm only, which is quite low and it can fit in almost all the computer cases. It is also not wide as it has 95mm of width and depth. The performance of this CPU cooler is amazing for its size and it can support up to 140 TDP CPUs including Core i7 and AMD Ryzen 7. A mild overclock can be done on this CPU cooler, but I would rather suggest to use with Stock speeds only for an impressive cooling performance. This is also a great cooler for Xeon processors (supported socket) for continuous running in workstations and servers. NT-H1 high-grade thermal compound comes pre-applied to the cooler base, which is pretty good and you don’t have to buy a good thermal paste additionally. The installation process is quite simple too with Noctua’s SecuFirm2 mounting system, which is very easy to set up. 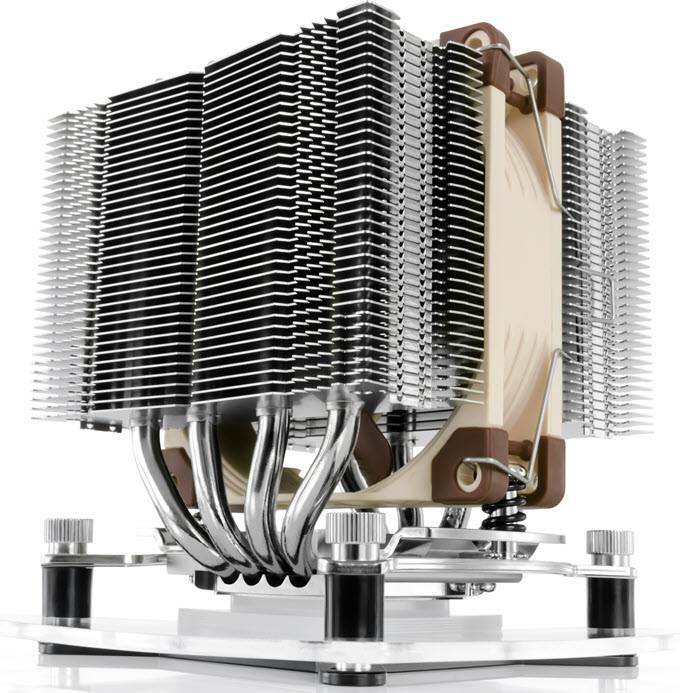 Another premium 92mm Noctua CPU cooler, but this one is a compact dual tower CPU cooler. It uses the same Noctua NF-A9 PWM fan (with SSO2 bearing), but here the fan sits in the middle of the two heatsink towers. This compact dual tower CPU cooler allows 100% compatibility for RAM and PCIe cards, even on mini-ITX motherboards. It supports all the Intel and AMD sockets that are supported by the above mentioned Noctua NH-U9S Classic CPU Cooler. The dual tower heatsink comes with four copper heatpipes and copper base plate for efficient heat transfer. As mentioned above also, the fan spins in 400RPM to 2000 RPM range and is quiet at 22.8 dBA. You can make it even quieter by using Low Noise Adapter (L.N.A. ), which comes included with it. It is also a Dual fan ready CPU cooler, which means you can install an extra Noctua NF-A9 PWM fan if you want extra cooling performance for your processor. Noctua NH-D9L CPU Cooler is only 110mm tall, which is even 15mm lower in height compared to the Noctua NH-U9S CPU Cooler. It can fit in almost all mini-ITX and SFF computer cases, and is even compatible with 4U and 3U Chassis for servers. NT-H1 high-grade thermal compound comes pre-applied to the copper base plate at bottom, and the SecuFirm2 Mounting Kit allows for simple and easy installation. When it comes to performance then the cooler is much better than the stock CPU cooler and you can easily run a Core i7 and AMD Ryzen 7 processor without having to worry about. Yes, you can do a mild overclocking on this but not too much. It also works great for supported Xeon CPUs and can run continuously in busy environments. Important Note: Some AMD motherboards may violate the 96x114mm keep-out zone specified by AMD, so NH-D9L & Noctua NH-U9S coolers can only be used with RAM modules of up to 30mm height on these motherboards. This is unarguably the best budget 92mm CPU cooler that you can get for your SFF case or compact motherboard. CRYORIG M9 CPU cooler comes in two variants, the CRYORIG M9i supports Intel Sockets only while the CRYORIG M9a is made for AMD Sockets. Other than socket or CPU compatibility, there is no difference between these two variants in terms of specifications. 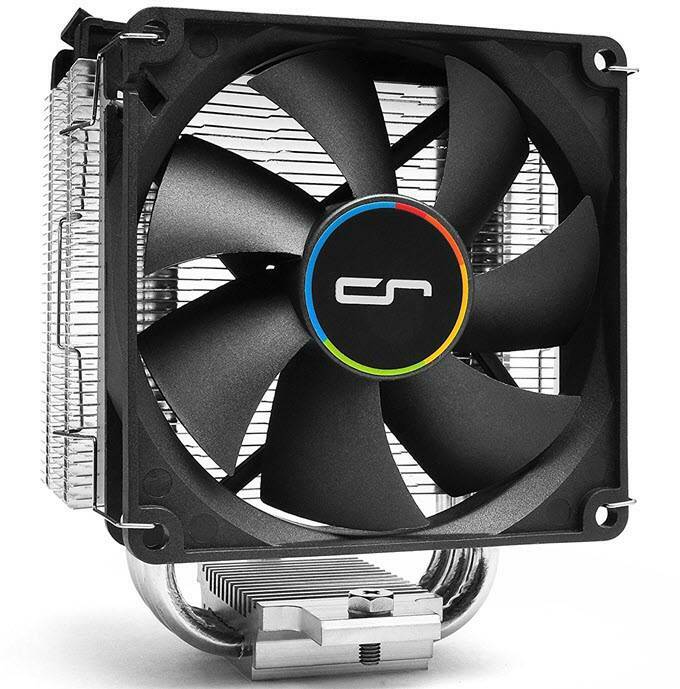 The heatsink of this CPU cooler features CRYORIG proprietary Jet Fin Acceleration System that consists of a structure of alternate fin stacks with wider air intake area and higher density air exhaust area to squeeze out hot air for better cooling performance. It is a pretty compact and slimmer CPU Cooler that comes with three copper heatpipes and a copper base plate for increased heat transfer to the heatsink fins. A 92mm PWM with 600 to 2200 RPM speed is there to cool down the heatsink. The CPU Cooler is pretty silent at low to medium loads and has maximum noise rating of 26.4 dBA. 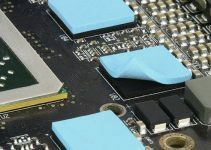 The CPU cooler does not hinder your RAM slots or any of the PCIe slots and provides zero interference for RAM of any height for both Intel and AMD platforms. 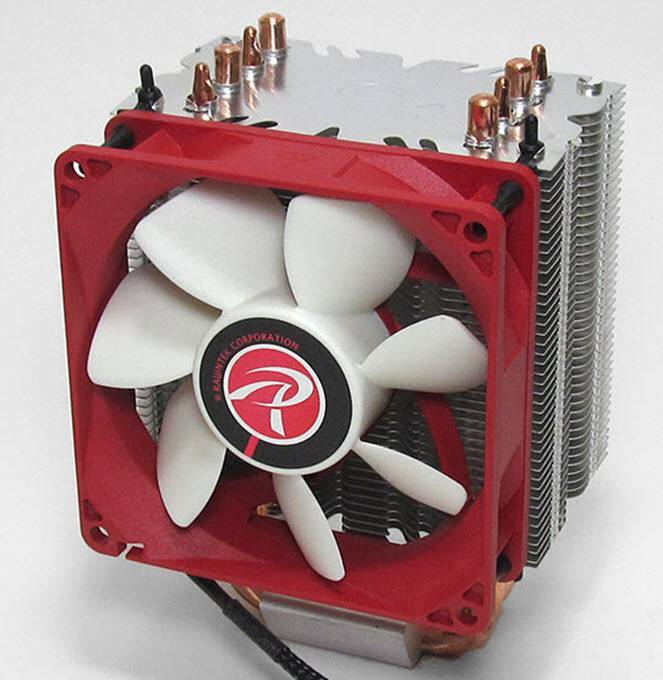 The height of the cooler is 125mm and it is also not wide at 102mm with fan included. It can easily fit in most of the mini-ITX, SFF and mini-tower cases pretty comfortably. When it comes to performance, then this CPU cooler provides 33% better performance over the Intel Stock CPU Cooler. The cooler can support up to 120 TDP CPUs but I would advise not to do overclocking on this CPU cooler. It is also very easy to install on both Intel and AMD motherboards. A tube of thermal paste (in syringe), and all the mounting brackets and screws comes included with the CPU Cooler. 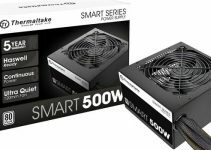 So, if you are looking for a cheap and lightweight mini-tower CPU cooler that offers much better performance over the Stock cooler then you don’t have to look any further. 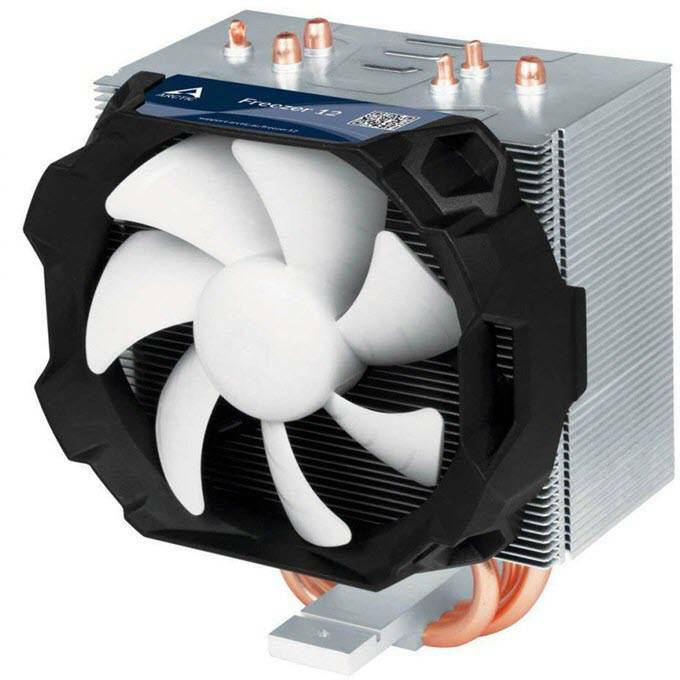 ARCTIC Freezer 12 is another budget 92mm CPU cooler for use in SFF builds. It supports variety of Intel CPU Sockets but only AM4 Socket support is present for AMD. This CPU Cooler employs semi-passive cooling technology, which is a mix of active and passive cooling working. Here, 92mm fans starts only when PWM signal reaches 40 % pulse width. Below this level, the fan remains turned off, making the CPU cooler completely silent in operation. After when the PWM signal reaches above 40% pulse width then it starts automatically to cool down the CPU. The PWM fan comes with Fluid Dynamic bearing with maximum speed of 2000 RPM, and is very quiet in operation even at full speed. The maximum noise rating of the CPU cooler is only 22.5 dBA. The slim heatsink on this CPU cooler comes with three copper heatpipes that have direct contact with the CPU for better heat transfer. The cooler supports up to 130 TDP CPUs and can offer up to 150 Watts of cooling performance. The CPU cooler is better than the Stock CPU cooler but is not at all made for overclocking. So, it should be used with stock CPU speeds only. This is a great CPU Cooler for HTPC and for users who prefer their PC to be silent for music or audio recording. It is also very compact in size, with height of 130mm, length of 108mm and 90mm of width. It also offers huge clearance for system RAM and PCIe slots. You can use RAM of up to 38mm in height with this CPU Cooler. The installation is also pretty straightforward and you will not face any issues fitting it. This CPU Cooler is also available with Dual Ball Bearing Fan as ARCTIC Freezer 12 CO. The CO version is designed for continuous operation for use in servers or workstations. Note: It must be noted that that heatpipes of this CPU cooler does not cover the full protection cap of the CPU, but only the processor DIE of compatible CPUs. RAIJINTEK is an emerging brand that is known for its high quality CPU Air Coolers, AIO and Liquid CPU Coolers. It also manufacturers computer cases and power supplies. Here we have a very good 92mm CPU Cooler from it, which is RAIJINTEK AIDOS. 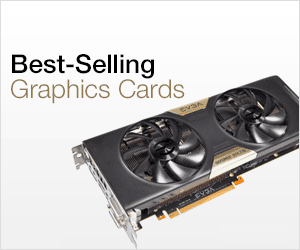 It is a powerful compact CPU cooler that comes with four (C.D.C. – CPU Direct Contact) heatpipes and a Sleeve bearing 92mm PWM fan that spins at 1000 – 2000 RPM. At low loads, the fan is quite silent but at full speed it can get loud (28.87 dBA). The installation of fan is done using rubber screws to eliminate vibrations and the noise generated due to it. It is compatible with all modern Intel and AMD CPU Sockets including AM4 socket. It is comparatively taller than other 92mm CPU coolers in this list with height of 136mm, but it is still compact enough to fit in most of the computer cases and with small form factor motherboards. Also, it offers good RAM clearance and clearance for PCIex16 slot too. Installation or mounting assembly is pretty easy and simple, and it comes with all the required mounting brackets and kits. The performance of this CPU Cooler is equivalent to that of Cooler Master 212 Evo, which is a very popular mainstream 120mm CPU cooler. You can perform little bit of overclocking on this cooler, but it is better to keep it for stock speed use only. 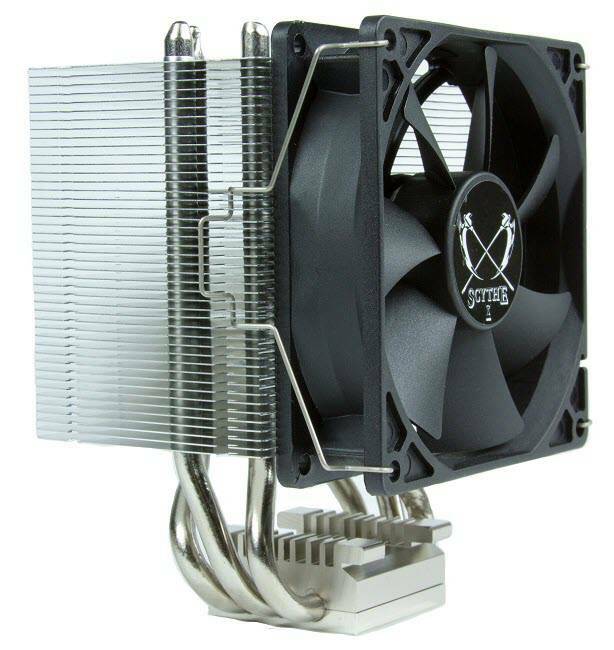 Overall, a very good 92mm CPU cooler for the price for use in compact or regular builds. Scythe Byakko is an amazing value for money compact CPU Cooler that packs good amount of performance. The CPU Cooler comes with three copper heatpipes and copper base plate for maximum heat transfer to the heatsink. Due to its offset heatsink design relative to the base, it offers almost 100% clearance for RAM of any height and for PCIe x16 slot. The Slip Stream 92 PWM fan on this cooler uses Sleeve bearing and spins at 300 – 2000 RPM. It may not be the quietest of fans, but it still remains quiet at low speeds but do get louder at full RPM or higher load. The maximum noise level rating for this fan stands at 28.26 dBA, which is decent. This compact CPU cooler is compatible with almost all the majority of Intel and AMD CPU Sockets. It is 130mm high and 83mm in depth or width. The Performance is also satisfactory and much greater than the stock coolers. The installation is very easy as it uses the push pin mounting system for Intel CPUs and for AMD processors, the installation is done using the clip mounting system or brackets. The CPU Cooler is mostly suitable for mid-range or budget CPUs that mainly include Core i5, Core i3, Ryzen 5 or Ryzen 3 series processors. On this CPU Cooler, overclocking should be avoided and also the high-end series processors such as Core i7 and Ryzen 7. Overall, a good budget friendly compact 92mm CPU cooler that you can get for your mini-ITX or SFF build. 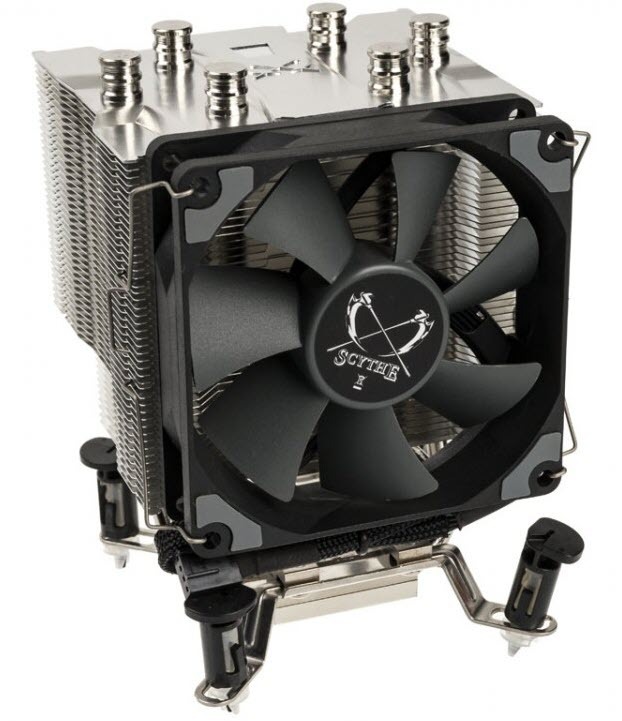 Here we have another CPU 92mm CPU Cooler from Scythe, which is Scythe Katana 5 CPU Cooler. This one is slightly bigger than the above mentioned Scythe Byakko CPU Cooler, but offers a bit better performance over it. The CPU cooler is a bit wider and a bit taller at 135mm, but even then, it is quite compact and is compatible with almost all of the SFF cases and motherboards. It also good offers amount of RAM clearance because of its asymmetrical and offset design of the heatsink. The CPU Cooler comes with three nickel-plated copper heatpipes and copper base, and new 92mm Kaze Flex PWM Fan. The fan comes with Fluid Dynamic Bearing (FDB), and spins at 300 -2300 RPM. It is quite silent a low to medium speeds but at higher speeds, you can hear it clearly as it gets quite vocal. The maximum noise level rating for the fan is 28.83 dBA, and is equipped with rubber padding at four corners to absorb vibration and minimizes noise. The CPU Cooler is compatible with wide of Intel and AMD sockets including AM4, and has pretty easy installation system. For Intel socket, it uses the super easy push-pin mounting system and for AMD sockets, it features the E.C.M.S II (Easy Clip Mounting System II) mounting system. The performance of this CPU cooler is great at Stock speeds, and certainly it is one of the best budget 92mm CPU coolers that you can get. You can also perform moderate amount of overclocking too, but that too under limits. Overall, an affordable high performance and high quality 92mm CPU cooler that will not let your down in any department. If you are looking for a good 92mm CPU cooler for Intel Xeon processors then here are some of the best ones below. These compact CPU coolers are designed to be used in Intel Xeon based Workstations and Servers. Noctua NH-U9DX i4 is unarguably the best 92mm CPU cooler for Intel Xeon processors for Socket LGA2066, LGA2011-0, LGA1356, LGA1366 and LGA2011-3. It is compatible with both Square ILM (80x80mm) and Narrow ILM (56x94mm) Intel LGA2011 Socket. The CPU Cooler is only 125mm tall, and can fit 4U server chassis comfortably. It is a dual fan CPU Cooler that comes with Noctua NF-B9 PWM fan, which is a very quiet fan. The fan comes with Noctua’s proprietary SSO2 bearing and spins at speed in range of 300 to 1600 RPM. This is a whisper quiet fan that has maximum noise level rating of 17.6 dBA only, and you can make it even quieter by using the Low Noise Adapter (L.N.A.) that comes included with the cooler. The heatsink of this CPU cooler comes with four copper heatpipes, and a copper base for maximum heat transfer and dissipation. The RAM clearance offered by the cooler is 34mm, which is decent enough but it would be better to use low profile RAM or standard RAM without heat spreaders with it. The performance of the cooler is nothing but great, and it keeps the CPU very cool even under full load during long hours of running. The SecuFirm2 mounting system from Noctua makes the installation a breeze, and Noctua NT-H1 thermal compound comes along with it in a Syringe. So, if you are looking for a durable and high-performance CPU cooler for your Intel based workstation or server then you won’t find anything better than this. Highly Recommended by me. 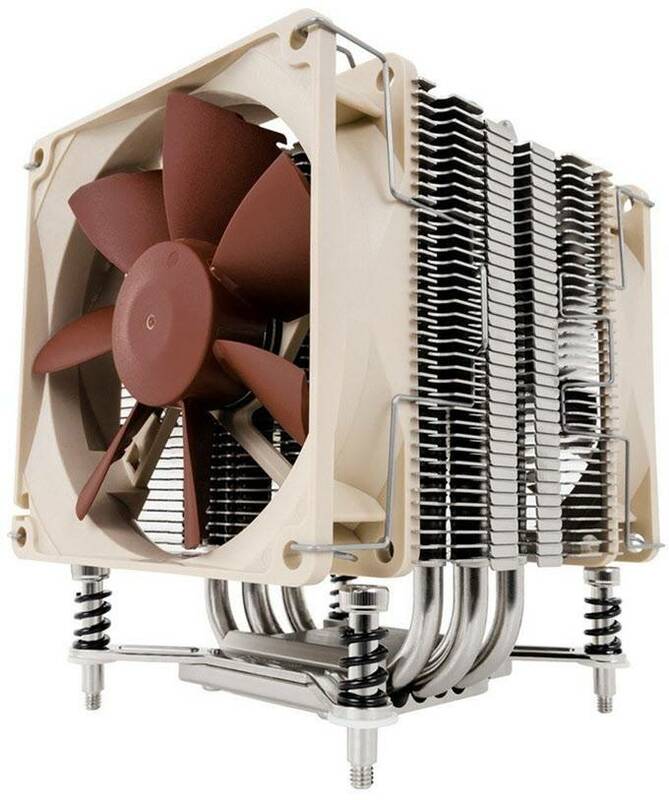 Noctua NH-D9DX i4 3U is a dual tower compact CPU Cooler that supports all the Sockets that is supported by the above mentioned Noctua NH-U9DX i4 CPU Cooler, including the Square ILM and Narrow ILM Socket for LGA2011 Xenon CPUs. This CPU cooler is more compact in design and support 3U chassis too that NH-U9DX i4 does not support. 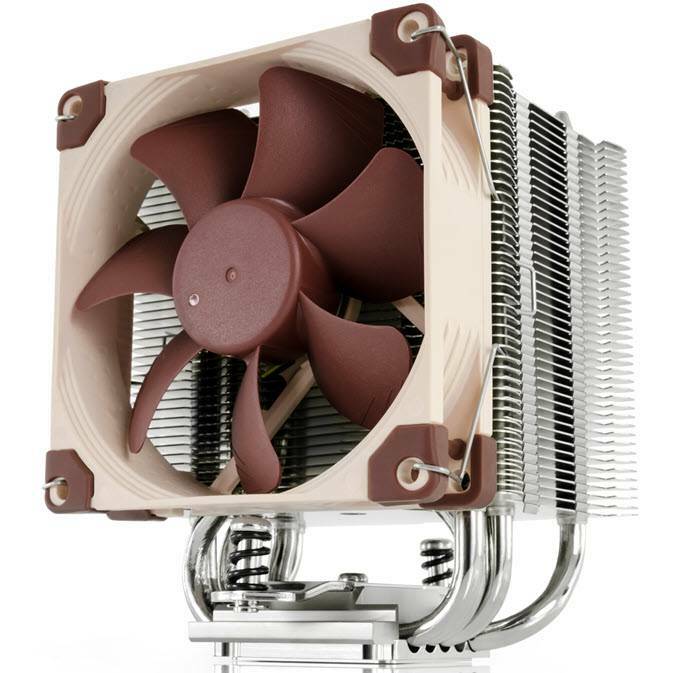 The performance offered by this CPU cooler is a bit on the lesser side compared Noctua NH-U9DX i4. It comes with a single Noctua NF-A9 PWM premium fan that is faster than the Noctua NF-B9 PWM fan in the above mentioned Noctua NH-U9DX i4 cooler. It uses the same SSO2 bearing but spins at higher speed in range of 400 to 2000 RPM. It is still very quiet and has maximum noise level rating of 22.8 dBA. You can also add an optional 92mm Noctua NF-A9 PWM fan if you have enough clearance, for better cooling performance. The twin tower heatsink comes with four copper heatpipes and copper base-plate to make the heat transfer faster and more efficient. The CPU cooler is only 110mm tall and is 95mm in depth and width. RAM clearance is not an issue with this cooler and nor the blockage of PCI-Express slot. The installation is quick and easy using the SecuFirm2 mounting system from Noctua. All the mounting brackets, screws, L.N.A., cables, and Noctua NT-H1 thermal compound comes included with the CPU Cooler itself. The CPU Cooler is ideal for noise-sensitive applications such as audio or video processing. This is unarguably the best compact CPU cooler for small form factor Xeon based workstations and servers. Here are some other 92mm CPU coolers that you may wish to check out. At the end I would like to say that 92mm CPU Coolers are great not only for compact SFF builds, but also for normal desktops if you don’t plan on doing overclocking or you don’t have a processor that is unlocked. These coolers offer much better performance than the stock CPU coolers that comes bundled with the processor. Most of them are capable of handling high-end desktop processors that include Core i7, Ryzen 7 or Ryzen 5 at stock frequencies comfortably. They also save a lot of space inside your PC case, allowing better ventilation and airflow, and does not block your RAM or PCI-s slots either. So, if you are still having trouble in finding the best 92mm CPU for your compact build then ask your queries here by leaving a comment below.